They finally got Al Capone for tax evasion. But what about plagiarism? It was once thought that Al Capone wrote the song "Madonna Mia" for his wife, Mae, while he was doing time at Alcatraz. But he most likely copied the music and lyrics from a songbook. 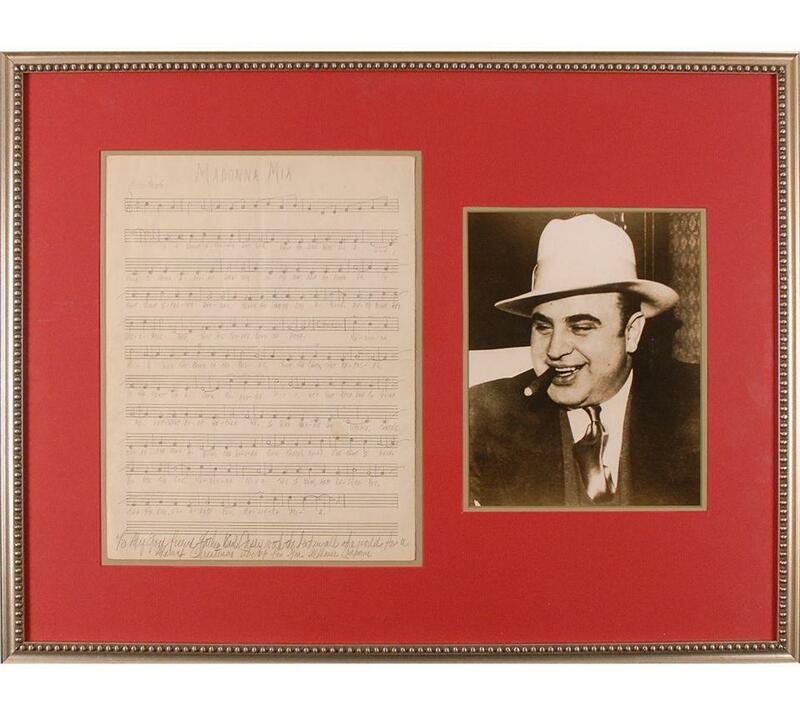 Al Capone may be remembered as a notorious gangster, but he had other interests besides breaking the law. He had a lifelong love of music. He strummed the tenor banjo and mandola when he was in prison, learned to play a number of songs, and even played in a band with other inmates at Alcatraz. For the longest time, it was thought that Capone wrote and composed his own music. But few examples of his songwriting were known to exist. One handwritten song, titled “Madonna Mia,” went on the auction block for $45,000 not too long ago. Another, titled “Humoresque,” sold at an auction in Massachusetts last summer for $18,750. But it turns out that Capone didn’t author either of those songs. He did write out the lyrics and musical notes in his own hand, but newly discovered evidence shows that he most likely copied them out of a songbook. Google the words “Al Capone” and “song” and “Alcatraz” and you’ll find dozens of news stories about the Chicago crime boss writing romantic love songs in prison. The two Capone music manuscripts for “Madonna Mia” and “Humoresque” “were in the marketplace for a long time,” said Bobby Livingston of RR Auction, a Boston-based auction house that sold the “Humoresque” manuscript last summer. The authenticity of the documents was rarely questioned because they came from a reputable dealer in Pennsylvania and had been checked out by experts, according to Livingston. The backstory — that the songs were purportedly written by Capone — was further bolstered when they were put up for sale by Butterfield & Butterfield, a prestigious auction house on the West Coast, in 1999. The lyrics and music of “Madonna Mia” were written out in Capone’s own hand on a blank piece of sheet music. Vincent Casey befriended Capone at Alcatraz in the mid-1930s. At the time Casey was training to become a Jesuit priest, and he visited Alcatraz regularly. Apparently, Capone enjoyed his company so much that he gave him a handwritten copy of “Madonna Mia” as a token of appreciation. “Madonna Mia” was expected to fetch at least $45,000. But it didn’t sell, and was ultimately returned to the consignor, according to Livingston. It was later sold to a private collector. When Capone’s other music manuscript, “Humoresque,” hit the auction block last summer, it caught the attention of musician Jack White, the former frontman of The White Stripes. White recently appeared on “The Tonight Show Starring Jimmy Fallon” and told the story of how he acquired the song. But White was still so impressed that Capone chose to write out the lyrics of “Humoresque” (“It’s a beautiful song for a murderer,” he told Fallon), he even recorded a cover of the song. It appears as the last track on his latest album, “Boarding House Reach,” which hit No. 1 on the Billboard album chart in April. “I was mesmerized and enthralled by the dichotomy of the other side of Capone. . . . The gentler side, the more human side,” said Larsen. But that changed after Larsen showed “Madonna Mia” to Anastacia Scardina, an actor-singer-songwriter from the Chicago area. She began to question whether the song was really about Capone’s wife, Mae. (If Capone had written it for his wife, why would he give it to a priest?) To her, it seemed as if Capone was describing the Virgin Mary. The more she read the lyrics, the more skeptical she became. She began to wonder whether Capone really came up with those words on his own. Scardina began doing research, and discovered that “Madonna Mia” was listed among the holdings of a historic sheet music collection at Brigham Young University. But Capone’s name was not mentioned anywhere. The song had actually been copyrighted in 1935 and Abner Silver, Al Lewis, and Al Sherman were credited as the authors. She showed Larsen what she found. The idea that Capone wrote his own music did not come out of nowhere. Capone told his son that he played the tenor guitar and tenor banjo, and he could play hundreds of songs on his mandola (“there isn’t a Song written that I can’t play”). He also told his son that he could transpose piano sheet music. But if Capone penned any original songs, they have yet to surface in the public eye. The Globe obtained copies of the 1935 copyrighted version of “Madonna Mia” and of “Humoresque,” which was copyrighted in 1932, and asked a music expert to compare them to Capone’s handwritten manuscripts. Jim Dalton, a professor of music theory at Boston Conservatory at Berklee, said Capone’s version of “Madonna Mia” was transposed to a key that many players would consider easier than the original, and “Humoresque” was written in a different meter, which was also a simplification from the original musical score. “He did do a decent job,” said Dalton. The revelation that the lyrics and notes didn’t spring from Capone’s imagination puts to rest a belief long held by crime buffs, historians, and even members of Capone’s own family. Jeff Burbank, a content development specialist for The Mob Museum in Las Vegas, echoed those sentiments. Burbank does a lot of research on famous crime figures, including Capone. Part of his job is to find the true stories behind the legends and lore that have developed over the years. But Capone’s grandniece said she was always skeptical. “We grew up in a very musical family,” Deirdre Marie Capone said in a telephone interview. Bobby Livingston, executive vice president at RR Auction, acknowledged that auctioneers had incorrectly described the manuscripts in the past. He wants to set the record straight. “We take these things very seriously,” he said. Livingston said he was not aware that “Madonna Mia” was written by someone else until he was contacted by the Globe. Although Capone didn’t come up with the lyrics himself, Livingston said it doesn’t diminish the value of the manuscripts, because the fact remains that Capone once put pencil to paper and transcribed these songs. “They’re beautifully done,” he said. Livingston said the artifacts still represent an “incredible piece of history” that help tell the story of Capone learning to play songs while he was incarcerated.